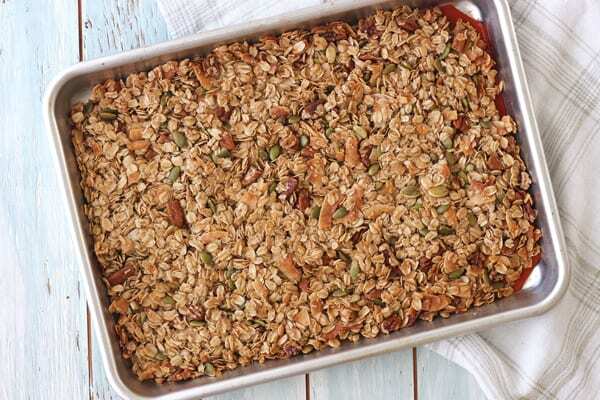 Toaster oven granola is easy to make and tastes great with milk, yogurt or plain. If you’re looking for a small batch granola recipe that so chunky and clumpy you can eat it with your hands then you’re in the right place. This post contains affiliate links, read our disclosure for more on what that means. Our original Mr. Toaster Oven retired so we added a Breville Smart Oven Pro and a little Oster to the family. After making this recipe about 1000 more times, we have a bunch of new toaster oven tips to share! 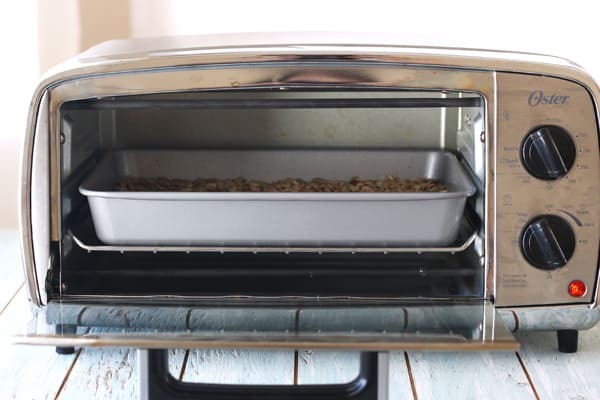 If you own a toaster oven there are two good reasons why you should make granola in it. 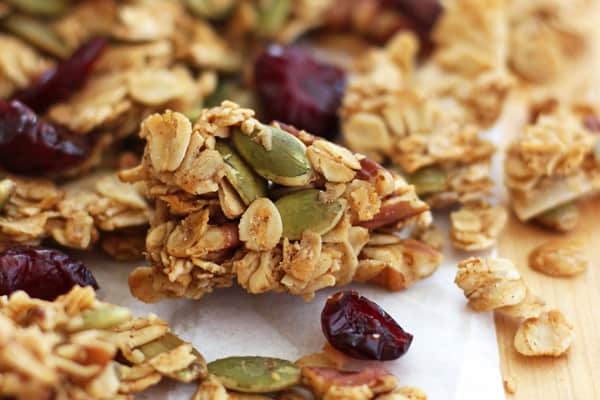 Reason #1: Everyone LOVES granola. It’s nice to have on hand for snacking. And homemade granola is the perfect gift to bring to any party or holiday gathering. 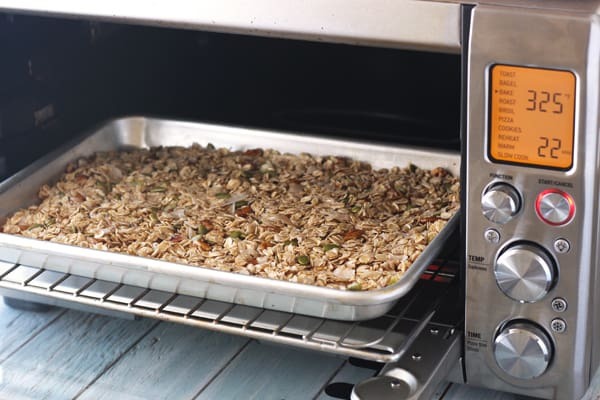 Reason #2: Making granola in your toaster oven is unbelievably simple. The only hard part is waiting for the granola to cool completely. Waiting is painful. I know. But don’t skip it. Leaving the granola to cool and harden (unstirred) for about an hour will guarantee you get the BIGGEST clusters and clumps. And that’s why we’re here right? If you can’t wait, check out this small batch almond granola. It’s a quicker but less chunky recipe that’s perfect for making a few yogurt parfaits with. Small Toaster Ovens: Use an 11 x 7-inch Baking Pan, like the one in this Farberware Toaster Oven Pan Set (affiliate link) and lightly oil the bottom and sides of the pan. 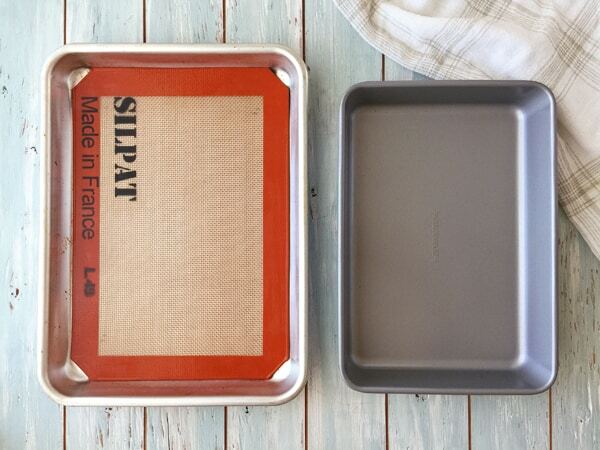 Big Toaster Ovens: If you can fit one, use a Quarter Sheet Pan (affiliate link), and line the pan with a Silicone Baking Mat instead of oiling it. 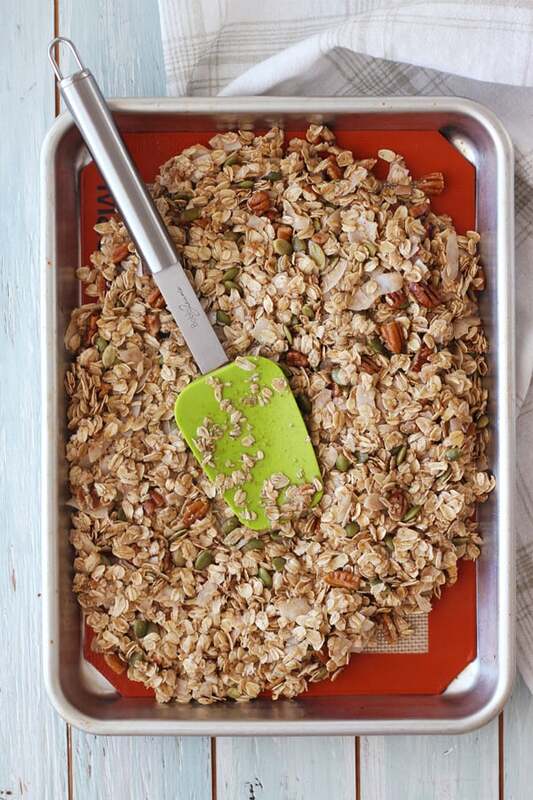 Because a quarter sheet pan is wider and longer, the granola will be in a thinner layer. That means it will cook faster than the 11 x 7-inch pan. So begin checking on it early. How Do You Know When The Granola Is Done? Your kitchen starts to smell amazing. Like toasted oatmeal cookies! The granola will be a nice golden color (don’t worry if it’s a little soft, the granola will harden and crisp further as it cools). If you’re using a darker pan or find the granola is getting overcooked on the bottom adjust the cooking rack from the bottom to the middle position. 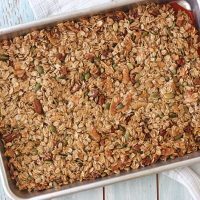 If your granola is slightly undercooked or chewy in the middle after cooling pop it back in the toaster oven for a few additional minutes. To prevent this in the future, press the center of the granola into a thinner layer before cooking. This way the sides (which cook faster) will be a little higher/thicker than the middle. The tasty combination of maple syrup, a little sugar, and buttery pecans makes this granola simply delicious. But if you prefer your granola on the sweeter side you can increase the brown sugar up to 2 tablespoons without a problem. While this recipe calls for two tablespoons of maple syrup you can substitute a different liquid sweetener if you’d like. We’ve tried it with brown rice syrup, light agave, and honey. Each of the sweeteners did add their own unique flavor and texture to the granola. Brown rice syrup = clumpiest, added no special flavor just a general sweetness. Agave = nice golden color, not as clumpy as brown rice syrup, lightly sweet. Honey = clumpier than agave, crispy texture, great honey flavor that brought out the cinnamon. The granola stuck to the pan even though we oiled it well, so use a silicone baking mat. Maple syrup = lighter not as crispy, smaller clumps than the brown rice syrup batch. Nice maple flavor and not too sweet. A small-batch of lightly sweetened delicious smelling granola that easily breaks into chunky clusters. Enjoy it with milk, yogurt or by the handful. Adjust your toaster oven’s cooking rack to the bottom position and preheat to 325 F. Line the bottom of a quarter sheet pan with a silicone baking mat or lightly grease the bottom and sides with oil. If your toaster oven is smaller, use an 11x7 baking pan. In a small bowl whisk together the coconut oil, maple syrup, coconut sugar, vanilla, salt and cinnamon until a syrupy mixture forms. In a large bowl combine the oats, coconut, pepitas and pecan pieces. Pour maple mixture over oats and nuts, stir well to make sure everything is coated with the syrup. Pour into the prepared pan. 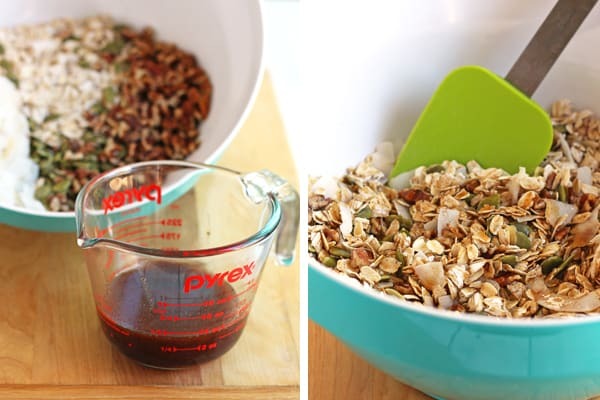 Use a spatula or the bottom of a heavy measuring cup to press and compact the granola into an even layer. Bake at 325 F for 22 to 30 minutes, turning the pan halfway through the cook time until the granola is golden brown all over. 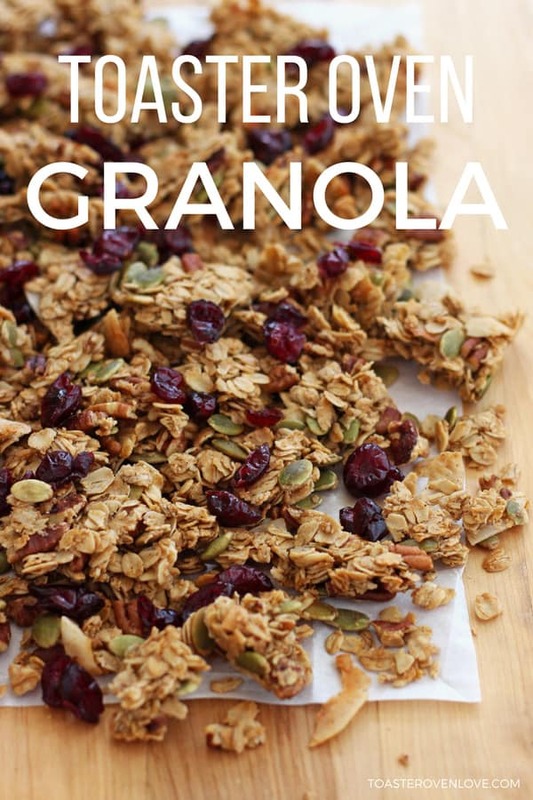 Allow granola to cool in the pan for at least 1 hour, then break into clusters and flakes. If desired, stir in dried cranberries. If your toaster oven runs hot start checking on the granola early and/or lower the baking temperature to 300°F. Store granola in a well-sealed glass jar for 7 to 10 days. Cook time includes 1 hour cooling time. The recipe makes 16 ounces (about 4 cups), Nutritional Information is an estimate of 2 ounces (about 1/2 cup). This recipe was adapted from the granola recipe in America’s Test Kitchen The Complete Cooking For Two Cookbook. If you’re new to small batch cooking or cooking in general, it’s a great resource filled with hundreds of simple no-fail recipes for two to choose from. 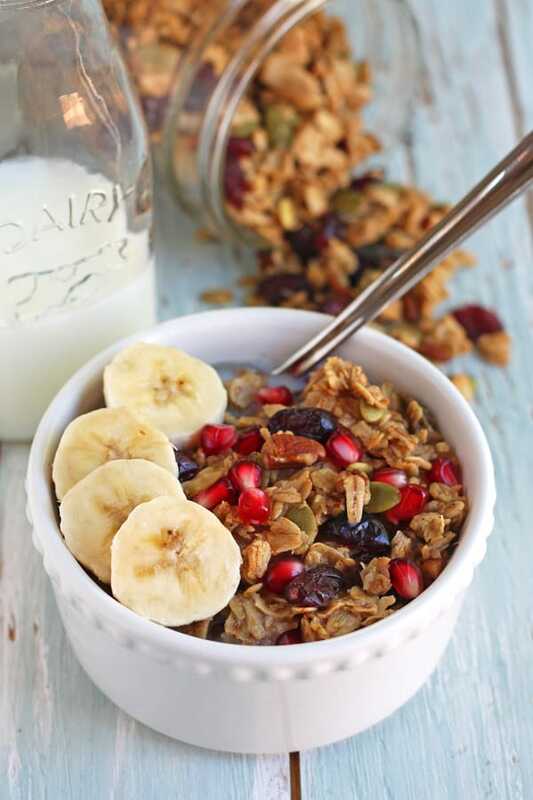 This granola looks perfectly crunchy and a good topping for my yogurt bowls! love it! I love that show too…and this looks like a granola that I’d love. Great tip for the parchment paper!